31 July 2006: Meeting the humanitarian challenge of Mauritania's unpredictable climate is no longer just a question of long forays across the trackless desert to locate and assist remote villages. 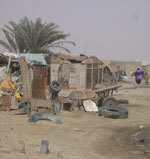 More and more rural Mauritanians are packing up and heading for urban areas to scratch out a living. People, who have lost everything but can still afford the handful of cash for a jolting ride across the country, flock there to look for work. For men it's carrying water and unloading trucks. For women it's sewing and cooking. Foitima Oloune, 55, a divorced mother of four from Keoleoloute village near Nema in the far south-eastern corner of the country made the long trek to the country’s capital, Nouakchott. After successive years of drought her animals all died and her food reserves could not sustain her to get through to this year's growing season. Accepting an offer from relatives to stay with them in the El Mina slum on the capital's outskirts, she gathered her children and a few possessions and travelled the 1,300 kilometres across the country. "Everyone in the village left," she said. "Those who could, came to Nouakchott. The rest, who could not afford a bus, walked to Nema." To get by, Foitima embroiders the detailed shawls and wraps Mauritanian women traditionally wear. Each month she can make two wraps, which at the most she will sell at the market for US$16, although sometimes she cannot get more than $10. After paying for new material, she is left with between $6 and $9 per month to feed herself and her children. "In the country when it rains there is no problem. We have meat, milk, cous-cous, and we help each other. Here there is nothing unless you work hard for it. But I would still prefer to be here if there are no rains because at least I can do something to survive," she said. Aid agencies say there are no statistics available for how many people there are like Foitima, struggling to survive in Nouakchott and other urban areas like Rosso, Nema, Keidi and Nouadibou. Locals say it is sometimes hard to tell the difference between where slums start and the city begins. Medical workers at the country's only hospital unit for severely malnutritious children, tucked away at the back of the national hospital compound in central Nouakchott, say 85 per cent of the 20 babies and children under five they admit every month come not from the countryside, but from slums on the city's outskirts. The only doctor in the ward, Moussa Slobu Diagana, said that since the unit was opened in 2000, the caseload has become "enormous”. The airless ward, which is infested with stray cats, is funded by the NGO Terres des Hommes. "Every year the number gets higher," he said. "Every time the rains fail in the interior, people come here to the city to look for work. Sometimes they find it. Sometimes they do not, and when they do not their children might end up here." Aminatou Logolouf, a community worker who has lived and worked in the El Mina slum for seven years, said the biggest problem she has seen is the absence of education. Stripped of the traditional support networks in their villages, where village elders and parents provide community guidance, people struggle to cope in the crowded, squalid environment. "All these people need to be educated about how to look after their children, basic sanitation and nutrition," she said. Logolouf said there is very little in the way of outside assistance for the slum dwellers and most people are unaware of what is available. For Zemalou Ahdelahi, a nutritionalist at the city hospital's ward for malnourished children, the solution is rooting families in the countryside. "The droughts have obliged people to displace to find work and food so they can eat. Some people find work here, but many find they cannot cope as it is more expensive in the city," she said. "There are already so many families trying to live here, and we get more coming in all the time. We need to find a solution in the interior, to stop people arriving," she said. The UN's World Food Programme (WFP), which provides the bulk of food assistance in the country, agrees with Ahdelahi. WFP's representative in Mauritania, Sory Ibrahim Ouane said that in the tough debate over where scarce resources would be used, rooting people in their villages rather than providing succour for those who have left wins out. "There is a growing fear in all the Sahelian countries and Mauritania in particular that there is increasing urban poverty, especially on the outskirts of the capital cities, and that people there are becoming more and more vulnerable. But our strategy is to fix the populations in the rural areas to avoid the exodus to the capital city," he said. "It is a policy which is resource driven as we do not have enough resources and there are choices to be made," Ouane added. "In making these choices, we think it is more important that we concentrate on children's education and their nutritional status and rural areas. Poverty is still more concentrated in rural areas." 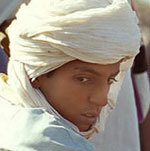 Mauritania, officially the Islamic Republic of Mauritania, is a country in northwest Africa. It is bordered by the Atlantic Ocean on the west, by Senegal on the southwest, by Mali on the east and southeast, by Algeria on the northeast, and by Moroccan-annexed territory of Western Sahara on the northwest. The capital and largest city is Nouakchott, located on the Atlantic coast. It is named after the ancient Berber kingdom of Mauretania.